CONVERSABLE ECONOMIST: Is the Euro Out of Danger? The euro was officially adopted in 1999, although it took a few more years to be phased in for everyday use. Over the years, my feelings about the new currency have see-sawed from one extreme to the other: wasn't sure it would be adopted in the first place, wasn't sure it would work if adopted, seemed to work pretty well at first, then led to large trade imbalances within Europe and a financial crisis, now seems to be functioning smoothly again. Is the euro now out of danger, or do certain underlying risks remain substantial? "First, Europe has a financial-stability problem. As a result of bad management, bad supervision and badly designed regulation, euro-area banks became deeply entangled in the global financial crisis. On the cusp of the meltdown, they were undercapitalized, overleveraged and blithely unware of the risks of investing in U.S. securities backed by subprime mortgages. European regulators were then slow to clean up the post-meltdown mess, which goes a long way toward explaining why Europe’s recovery has been so sluggish. "Third (and relatedly), fiscal policy is a problem. The euro area has an elaborate set of fiscal rules that are honored mainly in the breach. When Greece flaunted those rules at the end of the last decade, it was only following in the footsteps of France and Germany, which had broken the rules some five years earlier. Although the rules in question specify sanctions and fines for violators, those fines have never once been levied in the eurozone’s almost two decades of existence. "Fifth, the euro area lacks the flexibility to adjust to what the economist Robert Mundell, the intellectual father of the euro, referred to as “asymmetric disturbances.” There is no mechanism for eliminating the imbalances that arise when some member-states are booming while others are depressed, or when some members increase productivity more rapidly than others. It has no way of eliminating the chronic trade surpluses of some members and chronic deficits of others. Eichengreen discusses what is happening in each of these areas, with particular attention to the negotiations between Angela Merkel in Germany and Emmanuel Macron in France. Deals could be cut to address at least some weaknesses of the euro, but it's not at all clear that they will be. He concludes: Marine Le Pen, the hard-right French politician who opposed Macron in the second round of the French election, called the euro `the corpse that still moves.' Merkel and Macron now have a narrow window in time to breathe new life into its body." "Even so, the euro represented an extraordinary symbol of European integration. Far more than a simple convenience for travelers, the single currency eliminated exchange rate uncertainty. Trade among euro area countries increased by around 50 percent between 1999 (the launch of the euro) and 2011. The euro was also intended to contribute to the stability of national economies by facilitating the diversification of savings across European countries: households and companies could invest abroad at lower cost, and their wealth was therefore less dependent on local conditions. Finally, the euro was intended to facilitate the circulation of capital in southern Europe, strengthening the financial credibility of those states and thus allowing them to finance their development." "Germany has consistently practiced wage moderation (in a relatively consensual way, because the labor unions in the sectors exposed to international competition have supported it), while wages in the southern countries exploded. In the countries of southern Europe plus Ireland, wages increased by 40 percent while labor productivity increased by only 7 percent. This divergence generated low prices for German products and high ones for those from southern Europe. Unsurprisingly, intra-European trade became massively unbalanced, with Germany exporting far more than it imported, and the southern countries doing the opposite." For discussions of these issues in the Journal of Economic Perspectives, where I work as Managing Editor, readers might want to check Christian Dustmann, Christian, Bernd Fitzenberger, Uta Schönberg, and Alexandra Spitz-Oener, "From Sick Man of Europe to Economic Superstar: Germany's Resurgent Economy," in the Winter 2014 issue, and Christian Thimann, "The Microeconomic Dimensions of the Eurozone Crisis and Why European Politics Cannot Solve Them," from the Summer 2015 issue. "More broadly, the confidence created by the poorer countries’ joining the eurozone substantially lowered the interest rates paid by borrowers in these countries. The easier access to funds generated capital inflows. These inflows, sometimes combined with weak regulation of banks’ risk-taking, fueled asset price increases and created financial bubbles, particularly in real estate. 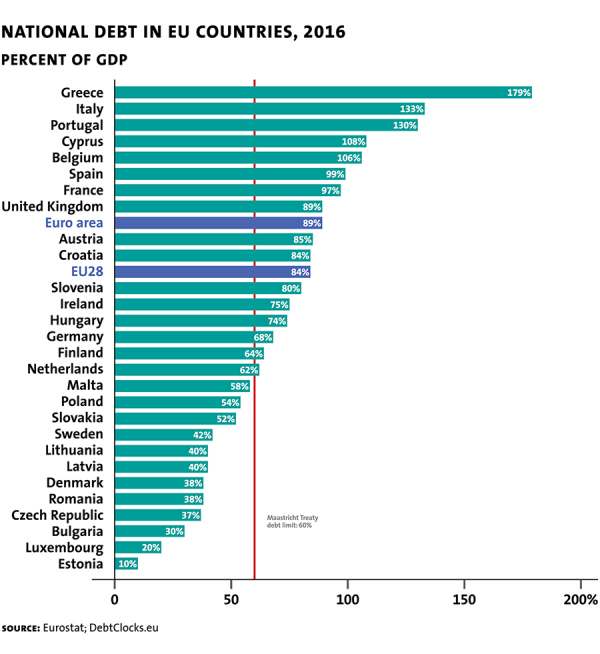 "Massive levels of debt, both public and private, are implicated in the origins of the crisis that threatens the existence of the eurozone today. Excessive borrowing was sometimes the fault of a spendthrift public sector or a failure to collect taxes (as in Greece), and sometimes the fault of the private financial sector (as in Spain and Ireland). When the Irish government budget deficit ballooned from 12 to 32 percent of GDP in 2010, it was because the banks had to be bailed out." As Tirole writes: "The Greek debt of 180 percent of GNP (characterized by a high rate of foreign holdings) is gigantic for a country with limited fiscal capacity, and has a long maturity (about twice as long as that of other national debts) and a low interest rate following the restructurings of 2010 and 2012. Payments are due to become large only after 2022, and then will be made over many years." Again, readers interested in these dynamics may wish to check some earlier JEP articles. 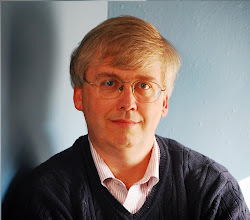 In the Summer 2012 issue, Philip R. Lane wrote "The European Sovereign Debt Crisis." The Summer 2013 issue included four papers on euro-related issues: Enrico Spolaore, "What Is European Integration Really About? A Political Guide for Economists"; Jesús Fernández-Villaverde, Luis Garicano, and Tano Santos. "Political Credit Cycles: The Case of the Eurozone"; Kevin H.O'Rourke and Alan M. Taylor, "Cross of Euros"; and Stephanie Schmitt-Grohé and Martin Uribe,"Downward Nominal Wage Rigidity and the Case for Temporary Inflation in the Eurozone." Tirole offers an even-handed discussion of the possible directions for the next set of reforms to solidify the euro, while admitting that at present, all possible directions are problematic. One set of options involves a greater degree of unification across Europe, which Tirole calls the "Maastricht approach." For example, there could be a European Fiscal Council that would track borrowing in different countries and sound the alarm if it seemed to be getting out of control. But as Tirole writes: "This fiscal council would have to truly represent Europe as a whole and have the authority to require prompt corrective action. In addition, since financial sanctions are not a good idea if a country is already in financial difficulty, other measures must be used — although these would only sharpen concerns about legitimacy and sovereignty. As things stand, the current impulse toward national sovereignty works against such improvement of the Maastricht approach." The other broad set of options, which Tirole calls the "federalist approach," instead starts from the assumption that the EU countries might look for certain limited opportunities to share risks and coordinate in limited ways. For example, one could imagine a system in which each country chooses its own pension contributions and benefits, but the pension funds themselves are run by a common European entity that would apply a common methodology so that scheduled payments into the system and promised benefits from the system remained in alignment. Similarly, one can imagine a cross-European plan for a least some minimum level of unemployment insurance, or a plan that provides for common standards of bank supervision and regulation, together with deposit insurance. But as Tirole points out, European countries have different political preferences, and so mixing countries with high and low pension levels, or high and low unemployment levels, or high and low levels of deposit insurance, is a tricky business. The euro situation is in a lull just now, which means there is some time and space for advance planning to reduce the risks of a future crisis. The question is whether European countries and institutions are going to squander their respite.